L.A. is really starting to turn in on itself and is producing great rock n’ roll and great night life. The Scream club has been a catalyst for L.A.’s new musical era. Attitudes are changing, people you meet are awfully proud that L.A. Is no longer in the musical shadow of New York. At one end of the city you still get the beach and the tan, but downtown you get maniacs with guitars that can break bones in 20 places. At Scream there are many rooms on many floors, though how many there are of each isn’t easy to tell. Every Scream night there are band rooms, video rooms, a room with nothing but a huge white skull, a room where a 50-piece piccolo marching band from Watts rehearses (they’ve been rehearsing for eight months but have never performed). There is also a tattooing room that only lets you in if you already have a large tattoo, and a room where a man dressed as Jesus with a life-size cross on his back crawls around on all fours begging for someone to buy him a gin and orange juice. There is also a room where you can get your legs shaved for a dollar. The bands and their music somehow tie the whole scene together. These various performers include elements of blues-rock, industrial, metal, dark and whatever else they utilize to achieve their ultimate sound. This record aims at showcasing the most promising of our local bands and demonstrating the diversity in music and attitudes in this city. Of the many unusual nightclubs that have dotted the Los Angeles landscape in recent years, Scream was perhaps the most macabre. The club featured three-dimensional slides projecting images of skulls, candelabra, chains and other ghoulish art. Its walls were done in Day-Glo paint, and banners with similarly horrific images hung from its ceiling. 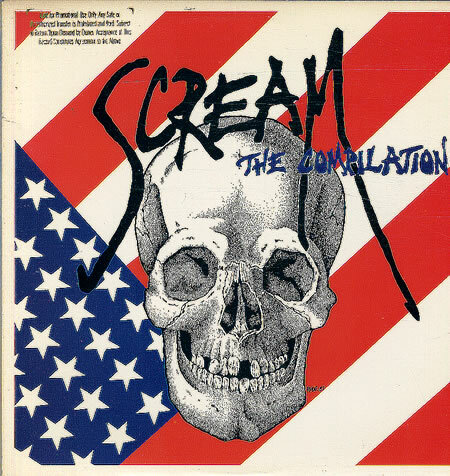 Scream’s taste toward the odd carried over into its music repertoire. The club hosted Los Angeles’ most adventuresome rock bands, like Jane’s Addiction and TSOL (True Sounds of Liberty). Unfortunately, Scream’s glory days were put to a halt when it was kicked out of its locale in the downtown Embassy Hotel last summer. The club hosted 4,000 mourners its closing night. But clubgoers need not weep for Scream. The club recently re-opened at the Park Plaza Hotel in the Wilshire District, except Monday and Friday nights, when it’s at the Probe in Hollywood. As if to commemorate the venue’s re-emergence, Geffen Records has just released “Scream: The Compilation,” a collection of tunes from acts that have become staples at the renowned club. The disc doesn’t pledge allegiance to any music style. It is a sampling of the variety of new music that has helped make the club famous. The album was assembled by Scream owner Michael Stewart and executive producer Mio Vukovic. Both were DJs at Scream.